there’s blog that i read everyday called Stuff Christians Like by Jon Acuff. it’s hilarious and the kind of blog i want to be when i grow up. Jon brings the hysterical 6 days a week. well, 5 days a week. sort of. he has what he calls Serious Wednesday. there’s usually still some humor involved, like referencing Jesus and Bring It On all in the same sentence, but one day a week he tackles real issues of faith and actually asks his readers to look at themselves a little closer. this blog is going to be my version of Serious Wednesday. only it’s not wednesday and i’ll probably be trying to figure out how to work in something about Rocky Balboa or magicians. okay, maybe not magicians because i had pom poms magically popping out of sleeves in my last blog, but Rocky is definitely on the table. 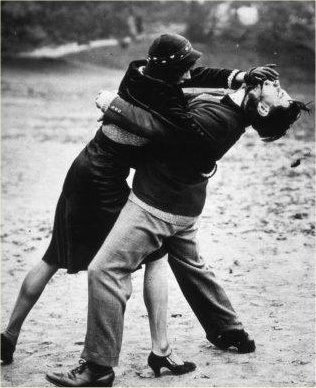 it takes two to tango and two to fight about how useless tango lessons are. it’s easy to find something to fight about, but can be hard to just simply choose not to fight about it. people think craig and i never fight. which is almost true. i don’t need all the fingers on one hand to count the number of real fights we’ve had. i don’t even remember what they were about except that one had something to do with Tetris. everybody argues. it’s a fact. and i say it’s a fact because i’ve never personally met anyone in a relationship who has never once had a fight with their beloved. if that’s you, i’d love to hear about it. comment away and share the secret. in the meantime, for the rest of us, here are some ways to avoid fighting. apply them as you will to your dating life, your marriage, your kids, your loser brother, whoever you yell at. 1. just don’t do it. its takes two people to have a fight. if you choose not to engage when you’re angry, then there’s no fight. you can walk away. people fight because pride roots them to their piece of ground and they defend it to the point of hurt feelings and ridiculousness. you have the ability to look at whoever you’ve jumped in the ring with and say, “i’m not going to do this. let’s take some time, pull ourselves together, then have a conversation when we’re not so upset.” then just walk away. this will leave the other person still yelling like a loon (which will make him/her feel foolish in a matter of seconds) or give them some food for thought and a higher respect for you if you actually follow through on completing the thought in conversation form. 2. talk about it before you’re angry. if something is bothering you, it needs to get out in the open before real anger or resentment set in. set some time aside when both of you are relaxed and ask for a few minutes to lay out what you’re thinking and feeling completely before the other person responds. 3. keep you emotions in check. when you’re laying out what’s bothering you, leave emotion out of it. that doesn’t mean do not explain how the issue makes you feel, it means to not go into a crying jag or allow accusation into your tone of voice. you want resolution. set the tone for the other person to feel safe to respond without being put on the defensive. 4. listen to the response. you’ve asked for the other person’s full attention to hear you out before responding, so it’s time to return the favor. give him/her the opportunity to say whatever he/she needs to say and pay attention. i’m willing to lay odds that most fights happen simply because of misunderstanding. giving the person who has hurt you the chance to explain may help you to realize that his/her intent was completely different than what you thought it was. 6. understanding that you do not have to win. don’t look at life as a competition for “rightness”. validation of your position is not a requirement for being satisfied. you can not force your thoughts down someone else’s throat and expect to gain any respect. 7. learn to laugh. sometimes fights will get to the point of ridiculous and if you give yourself a second to think about it, it can be really funny. it’s perfectly acceptable to stop a fight mid-stream and laugh about it. CAUTION: you will have to make it clear that you are laughing at both of you, not just the other person. don’t laugh at them alone. that causes more fighting. the right kind of laugh can defuse the situation. a well placed, “are you listening to us? are we really fighting about this?” (i.e. fighting over Tetris) can work miracles. 8. let it go. once an apology takes place, accept it. move on. you may have to do this more often than seems reasonable with some people (we all have at least one of those in our life) but it’s best for your own mental and emotional health to not keep a tally. when you choose to be a lover, not a fighter, a decent person will eventually take note of your example and things will get better as they, in turn, learn how not to fight. “you. all right! i learned it by watching you!” okay that wasn’t best example but any chance i get to use a good 70’s PSA makes me happy. someone who is probably not going to change will resent your efforts and continue to instigate conflict. if this is someone you’re dating, get out. that’s a deal breaker. it won’t get better after you’re married. i already said this, but it bears repeating. fighting is about pride. false pride. it’s about an unwillingness to lose ground even if that ground is sinking sand. but i’m here to tell you, walking away makes you the stronger person. finding a way to resolution that doesn’t involve bloodying anyone comes with its own sense of pride. pride in having done the right thing. pride in knowing that you’ve risen above base emotions and considered someone else’s feelings. pride in finding peace. This entry was posted in relationships and tagged advice, blog, dating, fighting, funny, humor, marriage, men, relationships, satire, women. My parents live by the mantra: “Would I rather be happy? Or would I rather be right?”. They’ve been married 30 years. i always thought the same thing about the dad. How about fight fair – no “low blows” I know we all can do it – we know our loved ones weaknesses – but try not to go there. If they don’t fight fair when you are dating well it’s never going to happen later. On a side note to your first point – if the other person isn’t tango-ing don’t keep trying to drag them around the floor – seriously it will only frustrate you more. My ex-fiance was famous for it – I would say it wasn’t going to explain/deal with his issue – like his jealousy or whatever and we could talk about it later when he was actually prepared to talk about, or when I wasn’t at work/church or wherever – he loved to pick the most inopertune time, and if I hung up (it was primarily a long distance relationship) and shut my phone off – oh the bloody mess that would create. If they don’t want to fight, making them will oddly only make you madder. excellent points. everyone…make a note if it. Marriage helped me learn number 6. Amazing concept. Regarding number 7. I heard about a couple once who, whenever they were in a fight, and it started getting too heated, the wife would just flash her husband. Ha, awesome. I’m trying that when I get married. When one person is right and another person is wrong the relationship loses.